Are you ready to become a Pokémon Master? 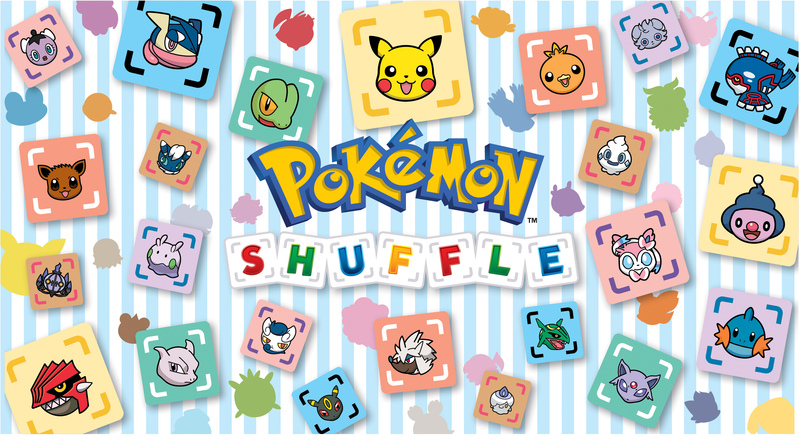 Originally released as a free game on the 3DS eShop, Pokémon Shuffle has inevitably made its way onto Google Play and the App Store. You won’t be battling Gym Leaders and challenging the Elite Four in this game, however. In Pokémon Shuffle, your goal is to clear various stages by lining up three or more of the same Pokémon and clearing these matches from the puzzle area. Doing so in succession will whittle down the opposing Pokémon’s health. If you manage to knock out the Pokémon within the allotted moves or time limit, you get the opportunity to capture it (or, if it’s a Mega Pokémon, receive its Mega Stone). I first started on Pokémon Shuffle on the 3DS after a friend of mine named it as her latest addiction. Curiosity got the better of me, and one download later, I was hooked. Now that it’s out on mobile, I’ve followed suit, having Pokémon Shuffle conveniently in my phone at all times. How To Play Pokémon Shuffle? 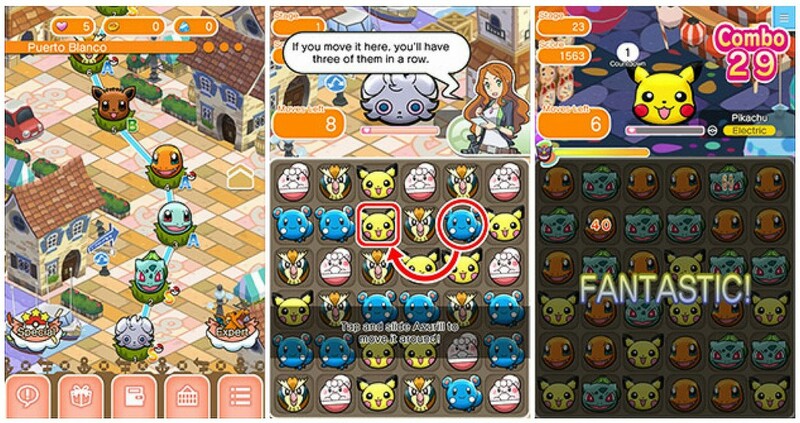 Pokémon Shuffle plays similarly to Candy Crush Saga and other match 3 games. Unlike Candy Crush Saga, though, Pokémon Shuffle allows you to swap Pokémon from anywhere around the board instead of just adjacent pieces. The more matches you clear, the more damage you deal to the opposing Pokémon. Reduce the opposing Pokémon’s health to zero to clear the stage. 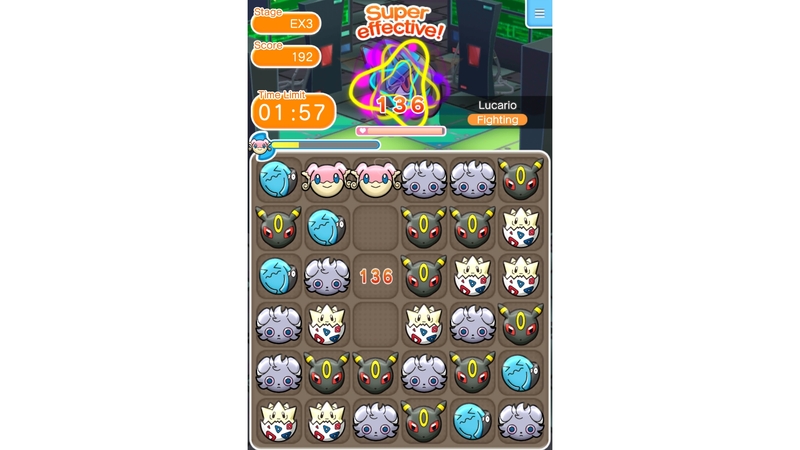 Matches that occur as a result of Pokémon cascading after you’ve made your move contribute to your combo, which helps in racking up a higher score. In most stages, you are given a fixed number of moves to clear the stage with, while in certain expert and special stages you are given a time limit instead. Failure to knock out the Pokémon within the allotted moves or time will result in failure to clear the stage. Clear the stage with leftover moves or time, however, and you stand to earn a higher rank. Getting an S-Rank means to clear the stage using only half or fewer of the moves or time limit given to you. Leftover moves and time also increase the catch rate of the Pokémon after you’ve defeated it. So do your best to clear a stage quickly or using as few moves as possible if you want to stand a chance of capturing the Pokémon. As you capture more and more Pokémon, you’ll start to amass a wide variety of Pokémon at your disposal. To anyone who’s played a Pokémon game before, you’ll know that type matchups are important. Knowing which Pokémon to use that have a type advantage against the Pokémon you’re going up against is key. However, taking note of each Pokémon’s specific abilities is important as well. Crowd Control/Crowd Power: When a match of the Pokémon is cleared, the more of said Pokémon you have in the puzzle area, the more damage you deal. This is especially useful in stages where you are limited to three Pokémon instead of the usual four, giving you more pieces of each of your Pokémon on the board. Damage Streak/Hitting Streak: This ability allows you to deal more damage the more times in a row it is triggered, meaning if you keep matching the same Pokémon with this ability and activating it at every turn, you’ll be dealing more and more damage as you go on. Quirky/Quirky+: This ability will occasionally erase 1 (or 2 for Quirky+) of the same Pokémon that triggered the ability elsewhere on the board. This increases your chances of a good cascade and potentially high combos. Mega Gengar: Mega Gengar’s Mega Power erases all Mega Gengar pieces on the board when it is matched, allowing for amazing cascades and very high combos. Mega Aerodactyl: Mega Aerodactyl’s Mega Power erases rocks and metal blocks on the board and deals additional damage to the opponent proportionate to the number of rocks and metal blocks erased. This makes Mega Aerodactyl one of the best Megas to use in stages with a lot of rock and metal block disruptions. 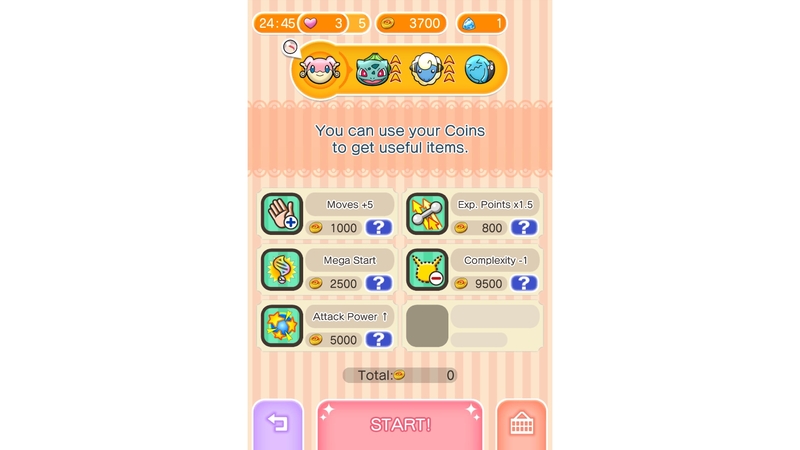 Before entering a stage, you are given the option to buy any number of power-ups using the coins you have earned from clearing stages. It’s useful to keep a good stockpile of coins at any time so that you can buy power-ups on difficult stages. Moves +5 is especially useful for stages when you’re so close to beating the opposing Pokémon and just need an extra move or two to do it. It’s also good for S-Ranking stages when you know that an extra 5 moves will put you under half the total allotted number of moves after clearing the stage. Do note that Moves +5 does not contribute to increasing your capture rate. Mega Start is useful for when you want to get a Mega Pokémon out immediately but would take too long to fill up their meter otherwise (like Mega Aerodactyl for example). Disruption Delay is available in stages that have disruptions such as rocks, metal blocks, freezing and what not. This power-up will delay the disruptions for half of the stage’s allotted moves/time, letting you go about your matching without the hindrances in your way. Complexity -1, at a whopping 9000 coins, is the most valuable power-up. It removes one Pokémon from your team from the stage completely, freeing up space for your other Pokémon and giving you amazing cascade opportunities. In stages where your opponent throws Pokémon at you that are not from your team, Complexity -1 removes one of those Pokémon from the stage. While this power-up uses up a lot of your coins, you actually find yourself hardly ever needing it. So try not to put down the coins for this unless you know you’ll absolutely need it. Every Saturday and Sunday, there’ll be a special stage named Meowth’s Coin Mania made available to you. This stage spawns a lot of gold coins that you can match to earn more coins from the stage. Of course, you’ll still have to beat the stage to get the coins, so don’t get too hung up on the coins and forget to deal damage! Every Saturday, you’ll also get a stage named Exp. Points from Victini! This stage gives you much more Exp. than regular stages, so slot in Pokémon you want to level up for this stage. Again, don’t forget that you have to beat the level to reap the results! Other regular stages that are good for farming Exp. are Stage 130 (Ampharos) and Stage 21 (Buneary) because they start with a high number of allotted moves, ensuring that you’ll finish with a lot of leftover moves, in turn giving your team more Exp. There are literally hundreds of Pokémon out there with just as many stages. Figuring out the tricks to some of these stages may require some experimenting with different Pokémon abilities and puzzling them out. Thankfully the game is simple and addictive enough to keep you going. If you’ve found this guide useful, share it with your friends! And let everyone know what your favourite Pokémon are to use!